One of Historic West Adams' major landmarks is the Angelus Rosedale Cemetery. Still in operation under the direction of the Angelus Funeral Home, it was founded as Rosedale Cemetery in 1884. It has grounds of 65 acres bounded by Venice Boulevard, Washington Boulevard, Normandie Avenue, and Walton Avenue. Many of the early luminaries of Los Angeles are buried here, including a number of the city's mayors. Rosedale was from its beginning the first cemetery in Los Angeles open to all races and creeds. Among its headstones are many prominent African Americans (such as Hattie McDaniel and Eric Dolphy), Latinos, Japanese, and Chinese (Anna Mae Wong) Angelinos. It was one of the first "lawn" cemeteries, built like a park with monumental stone art, many trees, and wide swaths of grassy meadow. Its grounds include a section of Civil War dead in rows of neat military headstones, as well as imposing tombs of famous Los Angeles families. The West Adams Heritage Association has worked to reawaken memories of these past residents by sponsoring its annual Living History Tours. Each year in the fall a half dozen famous or interesting people buried at Angelus Rosedale are selected, their lives researched, and community members enlisted to portray them, in costume and at graveside. 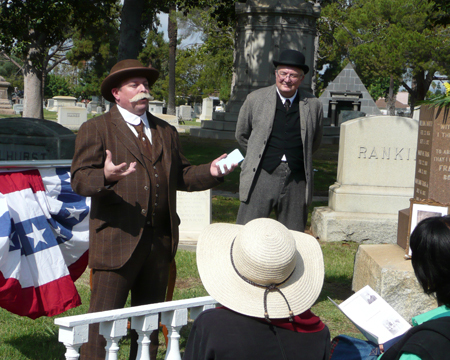 The 2007 Living History Tour was held this year on September 29, with presentations of six figures from Los Angeles history buried at the Angelus Rosedale Cemetery. Actors portrayed film director Marshall Neilan, silent film vamp Louise Glaum, film actor and radio personality Ernest R. Whitman, temperance advocate Francis Murphy, gold miner and plant nursery owner John Marcellus Stewart, and Western artist Eliza Griffin Johnston, who was also the widow of Confederate General Albert Sidney Johnston. Click here to go the the photo/slideshow page for the event. The photos are by our webmaster, Leslie Evans. "I spent yesterday morning surrounded by people who were dead before I was born." Here is a website put up by residents of San Buenaventura (these days, plain Ventura), California, to promote restoration of their local St. Mary's Cemetery. One page suggests emulating WAHA's Living History tours. As an example they have an extensive presentation on WAHA's 2003 tour. "How can we restore St. Mary's Cemetery?